More on those surveys that never were. Cornwall Council still insists world is flat | Cornwall – a developers' paradise? You have to give Cornwall Council’s planners full credit for being as slippery as a set of eels. First, they concede that they have no actual contemporary survey data to back up their regular claims that 80%+ of new housing in Cornwall goes to existing residents. But they still deny that their assertions were groundless. Like a rabbit from a hat, they’re now suddenly remembering another survey which completely proves their point. Of course, it was a ‘few years old’, but it surveyed 2,000 houses across Cornwall, or so a councillor claims. Or perhaps not, as an officer pipes up and says it was a ‘possibly pre-unitary’ District Council piece of research, which makes it pre-2009. They don’t know where it is though and it was never published. So we now have a ten year-old (at least) survey, gathering dust somewhere in a drawer, which is supposed to be the sole source of the Council’s fatuous claims that all new housing in Cornwall meets ‘local need’, while none of it goes to in-migrants. We don’t know exactly where and when it was conducted or by whom. And they can’t tell us what type of housing it covered or what its methodology was. And they can’t actually produce it (but promise they will). 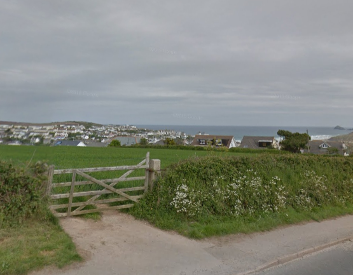 Land now being built on at Perranporth to provide houses, four out of five of which will go to local folk, according to Cornwall Council. Something about this mysterious survey just isn’t adding up. If it was such a genuinely robust and comprehensive piece of research then why didn’t the planners dig it out well before now in order to staunch the stubborn ‘myth’ (as they see it) that most new housing goes to in-migrants? Why didn’t they cite it in the various documents produced as ‘evidence’ for the Local Plan, if it ‘proves’ that all new housing merely meets local need? Is a single ten-year old survey really all that underlies the various assertions by councillors, planners and others that 80%+ of new houses go to local people? This doesn’t say much for their ‘evidence base’. Now, they’re trying to distract from the pathetic quality of their own ‘evidence’ by instead demanding that campaigners produce evidence that the majority of new housing is occupied by in-migrants. This is the usual brazen tactic of creating a red herring to hide their own sorry paucity of evidence. 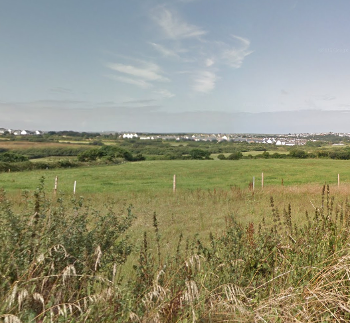 Will 80% of the houses built on this land at Newquay really go to locals? What amazing lengths to go to in order to cover up a reckless and irresponsible policy of housing and population growth, one that’s re-engineering Cornish communities, transforming our landscape and blighting our environment. This entry was posted in Cornwall Council;, environment, official statistics, planning system, population growth. Bookmark the permalink. We have to hope that the mathematical ability of whoever undertook this 1997 survey was better than their literary ability – it refers to people living in ‘currant’ homes! Not quite the same as a gingerbread house…. Pingback: In-migration running at record level | Cornwall – a developers' paradise? Pingback: Living in the end times? The Cornish crisis ramps up. | Cornwall – a developers' paradise?